This document explains how to get started with Chromebox for Meetings in Computer Science, room 2147 using two devices (remote controls) provided in the room. Turn on the TV and switch the input to HDMI 2. Once the screen is on, the TV will display the Google Hangout homepage. Use the black remote control to navigate to the Enter a hangout name screen. Enter CS2147, or another name of your choice, in the Hangout name field using the keyboard on the black remote control. To select an existing hangout, use the arrows to navigate to the preferred hangout room. If hangout room is CS2147, click https://go.wisc.edu/doit2147present. If hangout room is any other name, click https://g.co/present. To share hangout room CS2147, click https://go.wisc.edu/doit2147join. To share hangout room with any other name, use the Invite feature to add others to room. Once you join the call, the camera will automatically focus on the participants in the room. 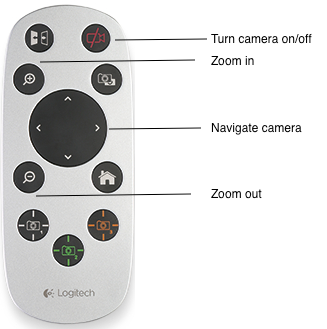 To adjust the camera, use the camera remote control as shown below. To end the call select the red phone on the black remote.